Dealership experience? – A bliss for a techie like me – each and every question I could come up with from my electrical engineering background was answered competently and exceed my own level of understanding/experience of electric things by a large margin. I was offered coffee every time and made to feel welcome. All promises were kept. The demo ride, on the scooter I eventually bought, was an eye opener, even for somebody who has in distance ridden around the world three times on motor cycles, mostly IN traffic. Ownership? – is as easy as buying it- the machine is fully developed, tested, run in (ha ha – what is that again??) and reliable. Insurance and licensing is all sorted. Mine is a demo model Volt 6 F with 20 000 km under the belt… what? Drive belt? ?… and still going like the proverbial bat! Living with it? – You can park it in the lounge – it will not drip oil. You can ride it in the house – it will not poison and pollute the air. You do not hear it, it does not vibrate. The irony of it all is: out on the roads you do not stink in anybody’s face but everybody stinks in yours. Especially those models with the dreaded D somewhere on the boot lid. Why buy it? Why not, I retort… there are mostly benefits: you cut through traffic, you park almost anywhere because you are not so BIG. The REAL reason is that I have surplus solar energy to use. Being a two-wheeler nutcase with an old car just getting older, sitting mostly unused in the garage, the electric scooter makes perfect sense for ‘riding around the pots’, it is the only affordable battery electric vehicle in SA at this time: 2017. But I CAN go to Somerset West from Bellville at 100 km/h plus some if I want to! Considered anything else? – Oh yes, certainly: the beautiful little Japanese girl called Yamaha 320 cc twin a sporty utility bike, at the same price level. But that would have been irresponsible, adding more pollution to the dirty air in the city, fuelling the oil industry even further in these days when it should long ago have started shrinking away. Riding it? – A bliss in one word. If you have ever paraglided, this is it. Silent, with just the cool breeze in your face. Addictive, for a trip near home I do not take a ‘responsible decision to take the e-bike, I take the decision based on the previous trip’s blissful experience! Having ridden (fossil) motor cycles for many years, how does the electric ride compare? The silence is overwhelming, the fact that you CANNOT annoy a motorist at the traffic lights when you work through to the start line, from where you always win the race, so you cannot be in their way either… except maybe if the mere SIGHT of a motor cycle annoys people? There was this angry old man (alone of course) in a HUGE diesel-turbo-300-horse-truck giving chase up a slight incline… I could HEAR (since my own ride was not making noise) those turbo’s spinning and whining their best, the pistons running mad, burning oil and belching black smoke for sure, but the man had to give up. With only 20 horses of clean power on my side I call this a shame 😉 I was also only one person. Doing this on any of my three fossil motor cycles would also have resulted in me ‘winning the race’, but by no means with the same level of satisfaction. Bottom line? – Buying the electric scooter was the ultimate step in my life towards a minimum personal carbon footprint. About the remaining CO2 I cannot do much except change the whole world, as in the agricultural sector which produces and the transport sector which brings my food and water to me, and of course the many other aspects of modern carbon-life. 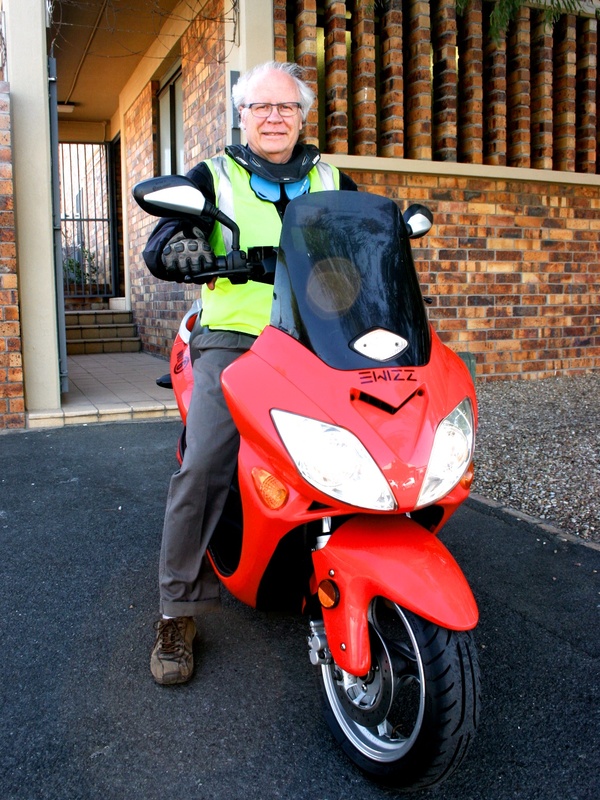 Ferdie has been riding bikes since very young and has been three around the word on two wheels. He is a retired electrical engineer with a passion for energy technology and has fitted his house with a clean solar energy solution. 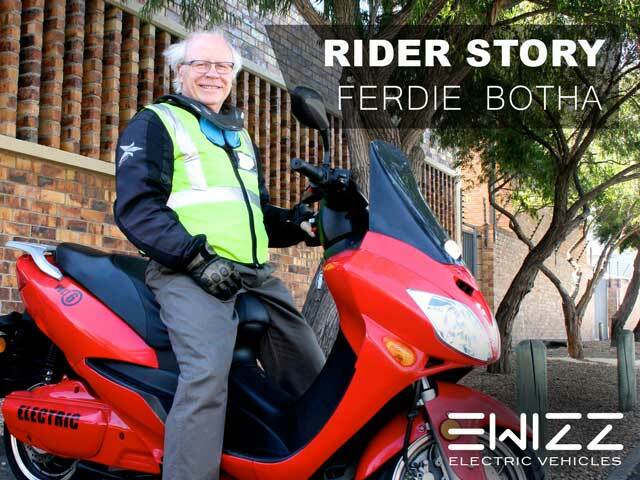 2 Responses to "Rider Stories – The Dragon Slayer – My experience of becoming an EWIZZ electric scooter rider by Ferdie Botha"
Can you get a plate / licence for these in CT? Hi Lawrence, yes these are all road legal and registered on the enatis system.